Over the next 72 hours the eyes of the surfing world will be focussed on a small stretch of ocean offshore from Praia de Norte, Nazare. On Friday (local time) the Big Wave Tour will kick off the new season with the Nazare Challenge, and then on Sunday the real challenge will arrive when an exceptionally large swell sweeps in from the North Atlantic. Various forecasts have been thrown around, yet wave size at Nazare is notoriously hard to pin down. Despite the difficulty, Praia de Norte is widely regarded as having the largest rideable waves in the world. And the reason for the extraordinary size? Whether it be WSL commentators or surf journalists, we’re told it’s because of the Nazare Canyon - a deep trench cutting through the adjacent continental shelf. The incoming swell supposedly travels up the canyon striking Praia de Norte without losing any of its energy to the shallow continental shelf. Yet when we look at the location of Nazare Canyon, particularly as it relates to Praia de Norte, doubt is thrown on that theory. The predominant swell direction for big Nazare is from the northwestern quadrant. The big winter swells sweep down from the North Atlantic striking the Portuguese coast at an angle. Both Friday and Sunday’s swells will hit at 290°, or west-northwest. Yet Nazare Canyon lies to the southwest of Praia de Norte. Coming from the west-northwest, much of the energy in those big winter swells won’t even pass over Nazare Canyon, let alone travel along it. So then, what’s happening at Praia de Norte? If the swells don’t pass over the canyon how do they get so damn big? It’s important to note that, despite Nazare Canyon being located to the southwest of Praia de Norte, the head of the canyon comes to within a kilometre of where the surfers ride the waves. 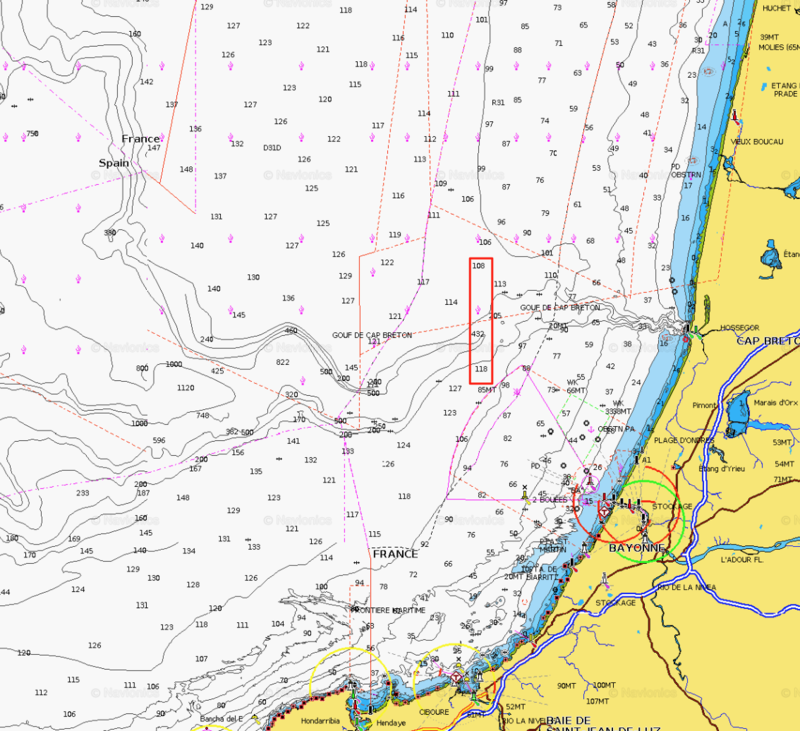 Detailed bathymetric charts show that the takeoff zone at Praia de Norte is between 15 and 20 metres deep, yet immediately to the south, at the canyon head, the depth is 125 metres. In fact, at one location, the seabed rises 70 vertical metres in just 140 horizontal metres. That’s a rise of 1:2, which is extremely rare on the ocean floor. 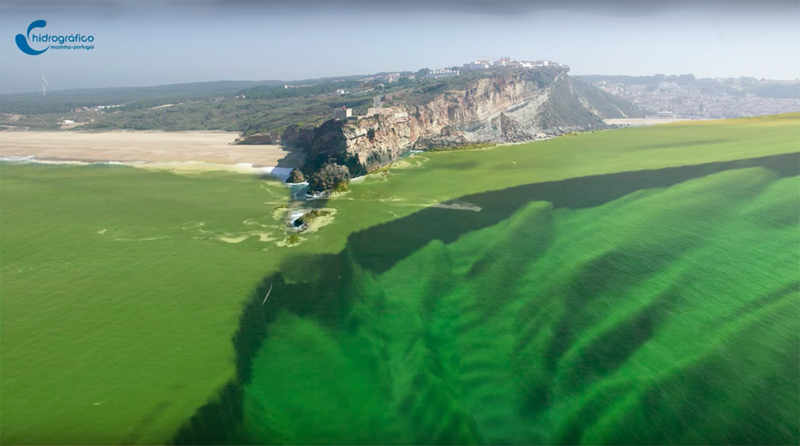 It’s this extreme difference in water depth that creates the extraordinary waves at Nazare. Before continuing, we need to point out that Nazare breaks unlike other big waves such as Jaws or Mavericks. Rather than having a single line of swell approaching the coast, Nazare is characterised by swell lines that run at angles. It achieves its extraordinary height by a process called constructive interference: those swell lines move toward each other and where they meet - i.e where they interfere with each other - the size increases. Outside of the science lab we call it a wedge. The typical set up for a wedge is a groyne or headland reflecting a swell back into the lineup. Yet a similar thing can happen when swells refract around an underwater rise. At Praia de Norte, northwest swells slow upon approaching the coast, yet just to the south the same swell retains it's open ocean speed due to the depth at the canyon head. This causes the swell line to refract towards the shallow area. The result is a swell that originally came from a northwest angle starts to bend and move towards the northeast across the Praia de Norte surf zone. And where the refracted swell interferes with the incoming northwest swell is where the wedges, ridiculously oversized wedges, occur. Therefore, it's not swell travelling up the canyon that creates the size at Nazare, but the sharp change in depth immediately south of the headland. And it also explains why wave size can be hard be so hard to forecast at Nazare. It’s not one swell the forecasters are concerned with, but the collision of two swells. Add to that the myriad angles of refraction and interference and you have the potential for a vast range of swell heights. Thanks Stu, that answers a few questions I'd had in my head for awhile about the position of the canyon being actually south of the break. Always fascinates me how certain elements come together to make a singularly unique wave. There's a spot just north of Mavericks, a kind of left cove which will be 4-6 ft when Mavs starts to break on the inside reef about 12 ft, you can literally sit there on your shortboard and watch the same swell lines triple the size a few hundred metres away. You should have been a science teacher Stu! 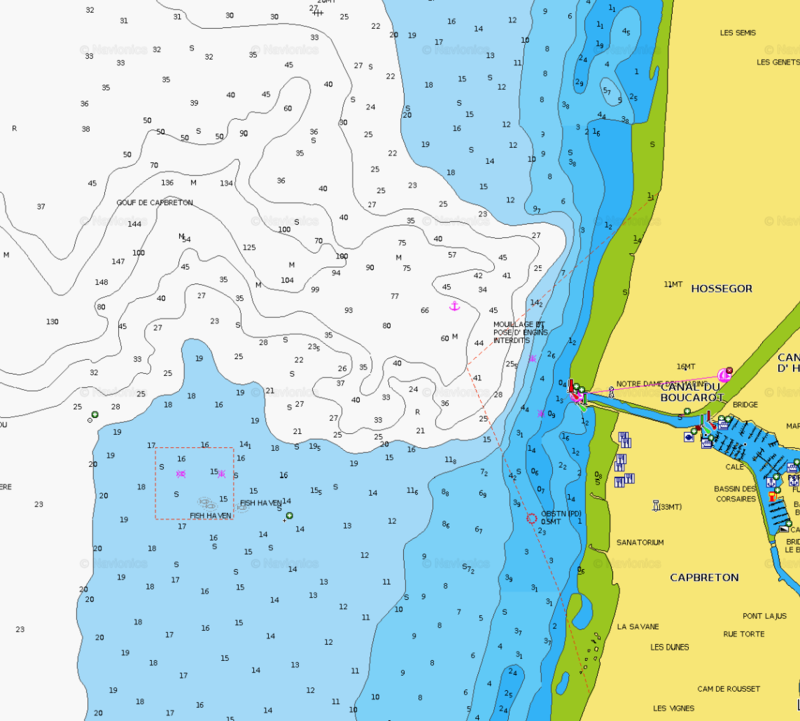 That's cool, love seeing bathymetric charts explaining places like Nazare. Is something similar happening at Hossegor? 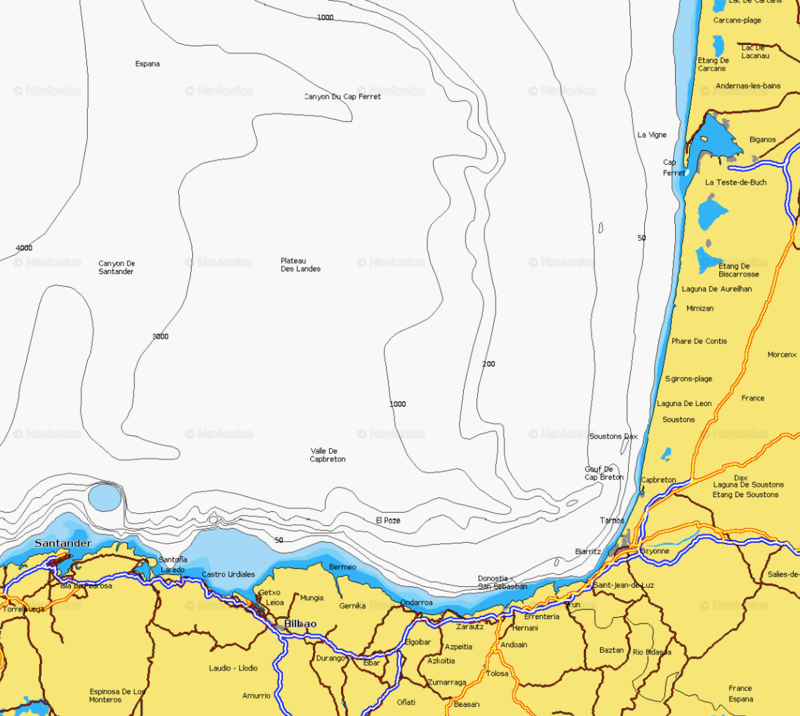 Often hear the Capbreton canyon credited with channeling swell into La Graviere but I'm pretty sure the canyon is further south and again aligned southwest. This chart shows the head of the canyon best - light blue contours denote the 20m depth mark. The canyon extends W, almost W/NW before swinging SW back, and then W/NW as it broadens into the Bay of Biscay upon reaching the continental shelf - trace the contours as you would a topographical map, and you can see the shape of the canyon clearly. 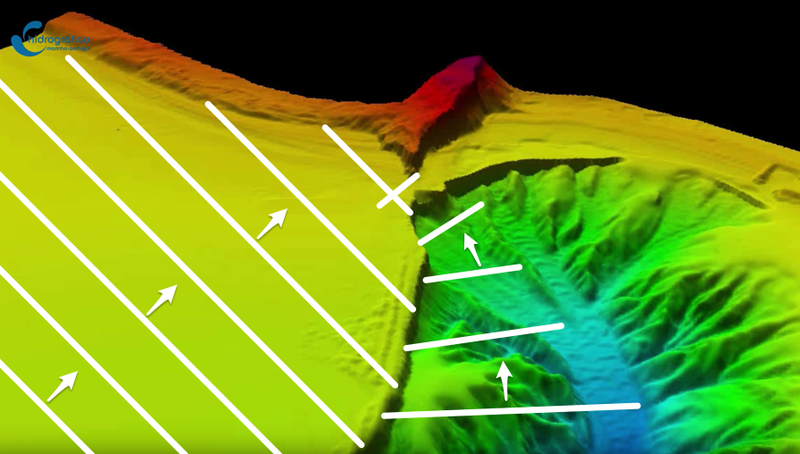 Also interesting to note the cross-section highlighted (about 16km offshore) - water depths are 432m at the head of the canyon, but rises steeply either side to about 110m depth. That is the source of some pretty serious swell focussing directly into Hossegor. Thanks for that. Could be mistaken but from the second chart I'd say La Graviere is about half way up Lac d'Hossegor so about 500m north of the head of the canyon. This is the discrepancy I mentioned but must be that swell funneled in NE from 16km offshore just hits the mark. Indeed you are correct, my measurements were out. I have no interest in Nazare and get bored after watching a few waves, but this is a good article i lobe these in depth kinda of articles. Would love to see more on different breaks. Do you think, at the end of the last ice age (13,000 years ago roughly) - with sea level much lower and landmasses extending much closer toward the end of the continental shelves - do you think there were far more large, powerful waves like Nazare, Hawaii or the Canaries? I've seen rudimentary bathymetric charts showing how the land (seabed) lay at the end of the last ice age but it'd be interesting to see more detail. A starting off point could be anywhere where the continental shelf appears at around 120m current depth. I like the fact that the North Sea was a populated landmass around the last ice age ie relatively recently. Fishermen pulling up worked bone artefacts, Orox and Mammoth bone 50 miles out makes things feel pretty temporary. Great analysis Stu. Timely and easy to understand. "Outside of the science lab we call it a wedge." Swellnet has a Science lab? That's worth my subscription right there. Thanks for this. Really interesting. Will be watching Nazare peaks tonight with interest. Maybe not as peaky as usual with all that west in the swell. It's probably been done before but I'd love to see why Pipeline is so powerful and breaks so hard. The swells seem confused on the outer reefs of Pipe but then seem to focus on the peak like a magnifying glass. 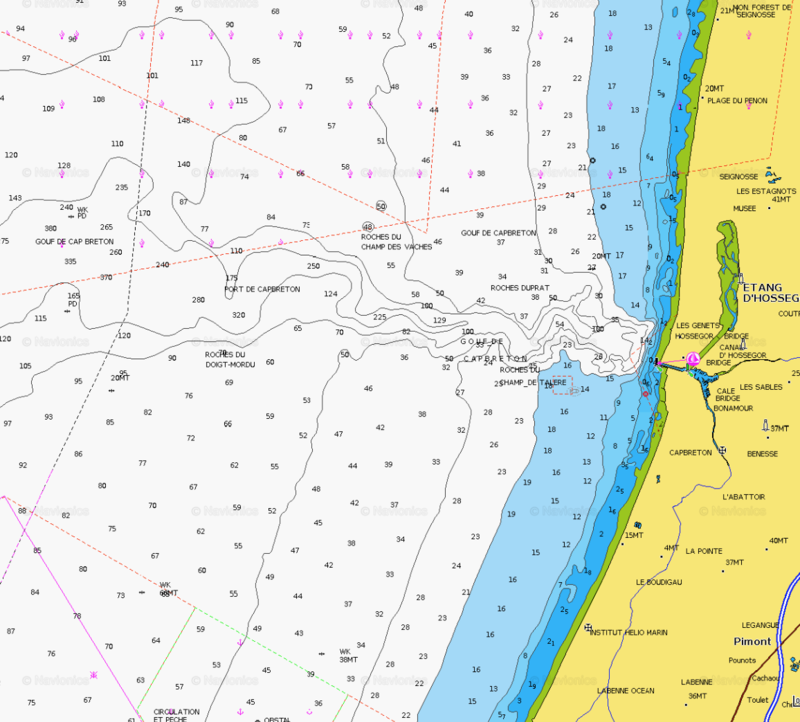 Is there any charts/diagrams like your Nazare ones above that show the bathymetry of the outer reefs of Pipeline? Interesting you say 1:2 is rare in the Ocean which by inference the grades are generally a lot flatter? Are tropical reefs also generally flatter than that as doing a bit of snorkelling around Cloudbreak there are some serious drop offs. Fiji has some very steep reef drops. Mini Cloudbreak (left off Momi Bay pass) scared the bejeezus out of me. Paddled 20m outside the lineup, and the water was black! Yeah snorkelling over the top of some of those areas is weird. Beautiful colours, shallow waters then black. When you dive next to those drop offs it like being in outer space and I only got down about 15 foot. He he, there's some stuff like that out on the Abrolhos. Sends a shiver down the spine! Fascinating article - very well done and well written! Being a mere mortal...I'm sorry but I can't possibly imagine how anyone could be interested in surfing the "wedge" at Nazare. Does anyone reading this have any desire at all to tackle this mountain? Though coursework with Phil Jarratt and Tom Wegener looks inviting.